I am a Chennai resident for the past year and a half. In this period, I have taken up several modes of transport in the city and tried various combinations of private, and public transport. Frustrated with everything, I finally bought a cycle. A cycle I use for my daily commute to work and for other purposes. Although, I have enjoyed the past five months of cycling around the city, there are a few things I wish for everytime I am on the road. I hope some of these wishes become a reality in this year. So here’s my wishlist for Chennai roads and streets. Taking from my disciplinary training in urban planning, I really wish Chennai had fewer one-way streets. Not only do one-way streets make it tough for drivers to merge and de-merge as they navigate due to potential conflict points between merging and demerging traffic, but one-way roads are also some of the most inefficient systems for traffic movements. 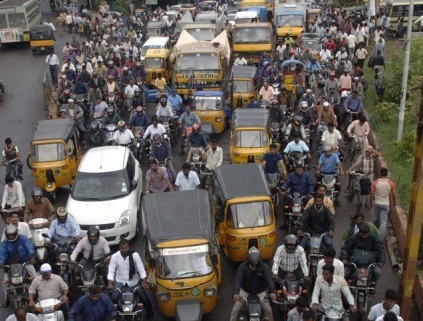 One-Ways streets are usually used if the planners want the traffic to attain higher speeds or improve the capacity of the roads (Source: Comprehensive Transportation Study of Chennai by Wilbur Smith Associates, August 2010). However, they are only short-term solutions that lead to commuters having to take longer routes for their destinations, and at times; resulting in inefficient systems for traffic movement. In the case of Chennai, in the last few years traffic planners have resorted to one ways because of the mismatch in the growth between motorable roads and vehicles. A research conducted by Transparent Chennai, IFMR LEAD, in 2011 found that most of the one-ways in Chennai are inside the city, with North Chennai having 60% of total one ways. It was observed that narrow right of way ( street width) limited the speed drivers could attain, thus, in turn completely defeating the purpose of devising one-way. In the long run, these one-way streets not only harm the road users, but the long duration on roads also increases fuel costs, causes air pollution and affects the over-all productivity of the city. Furthermore, the one-ways often have minimal refuge and crossings for pedestrians, which is a big hurdle for the pedestrians to cross, considering the heavy vehicular traffic and traveling speeds prevalent on these routes. However due to resource limitations, if one ways are the only viable solution, it is important to have additional road safety measures such as stronger policing for adhering to traffic etiquettes, provision of zebra crossings and use of amber lights to lower the speed at important crossings. Most cities I have travelled to, within and outside of India, have always had well designated spots where autos and vehicles stop on the road. For instance, many arterial roads or key main roads do not allow standing as it creates obstructions to traffic. However, in Chennai, I have noticed that there are no spots except bus stops which are designated spots on the road. Shared autos dropping off passengers in the middle of the road is a common sight in Chennai. So is precipitously stopping on seeing a passenger, with very little cognizance of the implications. How no hand signals or indicators not only jeopardizes their fellow passengers, but also puts vehicles behind them at risk of collisions, especially during peak hours where the vehicles are literally tailing each other.. In view of these erroneous practices, it is important that Chennai traffic policy, along with municipal authorities, designate halt stops on major roads and neighbourhoods. These designated halt spots can be used by both private vehicles, and autos, and shared autos to wait for passengers. Roads are not just the asphalt or concrete section of the road. There are a lot more components to roads which are rightly called ‘Right-of-way’ and they include elements like pavements, bike-lanes and utility lines. However, the current situation of our roads suggest that a clear design policy is missing. Firstly, our roads are not equitable to pedestrians and cyclists. This is evident in the accidents data too. As per the above mentioned Transparent Chennai research, pedestrians and cyclists together form 33% of the accident affected parties in the city. Such a high figure could be due to lack of designated bike lanes, provision of crossings for pedestrians and footpaths/ pedestrian pathways for safe travel. Chennai traffic planners need to be equitable in their planning and not be driven by a car-centered design policy. Both cyclists and pedestrians deserve space on Chennai roads! Secondly, it is important that lane markings are also drawn on all arterial and sub-arterial roads, which currently are missing across most roads in the city. These lane markings would help in road discipline as drivers can easily follow the lane markings to stay in their own lanes and not change lanes. Lastly, there is lack of speed limits in the city. Often municipalities and traffic authorities, with guidelines issued by Ministry of Road Transport device speed limits to reduce the risk of accidents. For instance, in Delhi, several road stretches have limits of 60 Kmph and traffic police use lasers to check speed limits. However, in Chennai even though government has issued speed limits for National Highways and State highways, there are very few instances where traffic police has taken steps to check vehicle speeds. Instead traffic police uses barriers such as steel gates etc. which not only reduces the overall width of the roads, but also are a safety hazard, especially at night with lack of adequate indicators and lights. Therefore, if speed limits are to checked, we need to ensure capacity building of traffic police force and also come up with traffic engineering tools such as speed breakers, banners etc to check speeds. In conclusion, Chennai has the potential to transform into a well networked city that is safe and convenient for both vehicle users, cyclists and pedestrians. My key suggestions are to re-think the concept of one-way roads, designate more halt spots for buses and auto-rickshaws, and design a more effective and integrated road policy. I sincerely hope the above suggestions, drawn from my personal experiences in Chennai and my learnings at urban planning school, will facilitate the traffic police and transport planners in doing so. I hope some of my wishes come true!